And so Vegan Week continued today, and I'm happy to report that it's vastly improved from Day 1. Perhaps I was spurred on from the successful completion of my weightlifting DVD yesterday, or perhaps I just had better food today. Regardless, I think it can be considered a success. Though it wasn't without its own soy-laced intrigue. For brekkie, I started with a whole wheat English muffin, and topped with my almost-vegan cheese and Yves Breakfast patties. I have to confess to being a little bit perplexed by the idea of almost-vegan cheese...I mean, the cheese is soy-based (i.e., not made with milk) but contains a hefty dose of various milk ingredients. I'm not sure who is supposed to eat this stuff! I thought the main objectionable ingredient in regular cheese was rennet (i.e., many lacto-ovo vegetarians will eat cheese, but only if it doesn't contain rennet from animals - vegetarian cheese does exist). So why would anyone buy this soy plastic gritty slice of processed garbage? If it isn't suitable for vegans, and most vegetarians can eat non-soy-based cheese (depending, of course, on the availability of vegetarian cheese).....who would willingly subject themselves to that more than once????? I now have 11 unopened slices. Anyone want them? The breakfast patties were pretty good though - I didn't mind those at all and would probably stick them in a breakfast scramble with eggs (if it weren't vegan week!). Tasty stuff! For my mid-morning snack, I experimented with soy again, this time in the form of So Nice Chocolate Soy Milk. I found this in drinking box format and thought it would make a good little treat....21 g of sugar though! Yikes. It was okay. The first sip was not nice, but as I sipped a little more, it got better. ..I just wish it had more of a chocolate flavour (being a sworn devotee of Lindt 70%, I found the chocolatude decidedly lacking). Lunch was leftover tofu/sweet potato cakes (I know, I hated them yesterday, but I certainly didn't want to let food go to waste!!!!!). It was slightly more palatable today, but it's still not going to see a rerun. Dinner, on the other hand, was awesome. It was free of processed wackiness, and it was a much more natural take on veganism. This kind of veganism, I can go for. I made two separate curries and had them over basmati rice (was going to go for brown rice, but figured dinner was healthy enough on its own). 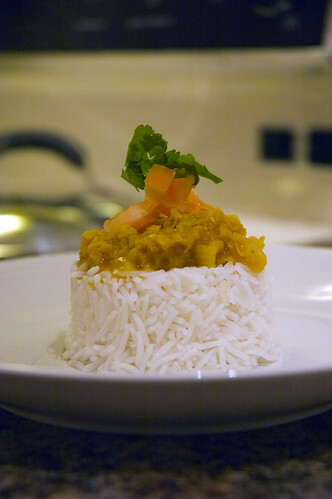 The first curry I made was a mixed vegetable curry....it was spicy, exotic, fragrant and just plain old yummy. Okay, okay, I know it looks like a lot of ingredients. But it doesn't take long! 1. In a large pan, heat a bit of olive oil on medium heat. Add onions, garlic and ginger (aka "the aromatics). Sauté for about 5 minutes. 2. Add curry paste, cumin, dried coriander, turmeric and combine well. 3. 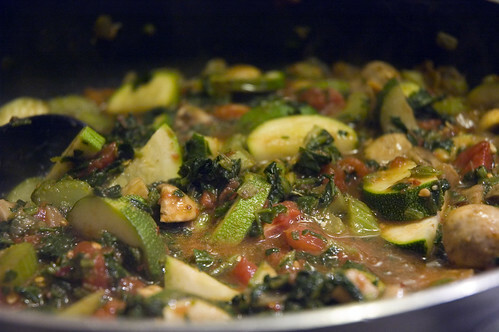 Add zucchini, mushrooms and celery, and saute/combine for a few more minutes. 4. Add undrained can of tomatoes (you could sub 3 c chopped tomatoes and add a little liquid), as well as the spinach. Toss in vanilla, cinnamon stick and bouillon cube. Let simmer for about 10-15 minutes to allow flavours to meld. To make this curry a full vegetarian meal on its own, you could add a can of drained, rinsed chickpeas or other bean to beef up the protein/fibre. Red lentils are great because they cook so fast! 1. Heat a bit of olive oil in a large pot on medium heat. Add aromatics and sauté for about 5 minutes (careful they don't burn - scraping off the residue is a big biatch). 2. Stir in curry paste (I love Patak's) and really, as I said, the hotter the better. You want this baby to burn twice. 3. 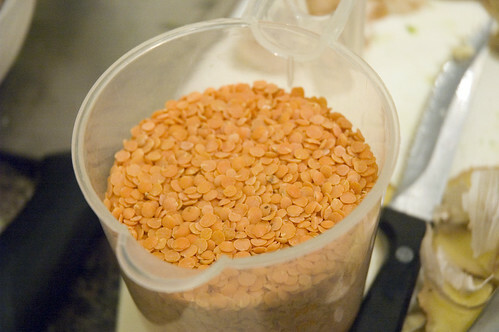 Stir in red lentils until well combined. Slowly pour in stock and bring to a boil. Simmer away for 15-20 minutes until lentils are soft and turn yellow. It's that easy. ANYONE can make and love this curry. It's fast and healthy and I would recommend it to anyone!!!!! Is that yum or what....and my friends, this one actually was as good as it looks. You should all make it. The added bonus of making all that food is that I know have five containers filled with leftovers. Woohoo! Thanks for reading! And feel free to comment.....I live for feedback and I know you're out there reading....what do you think? I will definitely try the red lentil dal! Both of those curries look delicious! I will certainly keep those recipes handy next time I've got a curry craving. Yay for successful Day 2. As for that cheese, EW!!! and WTF!?! Mmm.... curry.... Must give those recipes a try soon! I too, echo an "ew" for most soy cheese. For non-vegan week, I highly recommend the Yves veggie ham slices with egg, cheese (your choice on soy or no) and a toasted English Muffin - a very very yummy "Egg McMuffin"
I don't understand. If you're an un-Goddess, how can your Mixed Vegetable Curry make me a god (with my wife, at least)?